Review by AllTheBestFights.com: 2017-10-22, fight not particularly good between Ken Shiro and Pedro Guevara: it gets two stars. The undefeated Wbc light-Flw champion Ken Shiro entered this fight with a perfect record of 10-0-0 (5 knockouts) and he is ranked as the No.3 light flyweight in the world (currently the #1 in this division is Kosei Tanaka). Between 2016 and 2017 he has fought and won four times beating Atsushi Kakutani, Toshimasa Ouchi, Lester Abutan and Ganigan Lopez (=Lopez vs Shiro). His opponent, the former Wbc light-Flw champion Pedro Guevara, has a boxing record of 30-2-1 (17 knockouts) and he entered as the No.5 in the same weight class. He lost to Yu Kimura in 2015 (via split decision, Guevara vs Kimura) but then he has won four bouts defeating Jerry Tomogdan (=Guevara vs Tomogdan) and Oswaldo Novoa in his last two (=Guevara vs Novoa). 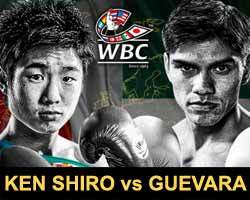 Ken Shiro vs Guevara is valid for the WBC World light flyweight title (Shiro’s first defense); undercard of Hassan N’Dam vs Ryota Murata 2. Watch the video and rate this fight!